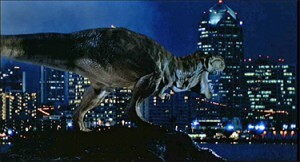 Warner Bros. Buys Sci-Fi Project Involving Dinosaurs!!! Warner Bros. has just bought a big sci-fi project that involves dinosaurs. The project, which is being kept under wraps will feature a rapidly evolving species of dinosaurs that attack Los Angeles in present day. This has Roland Emmerich’s name written all over it, but John Clisham will be directing and writing the film. Clisham worked with James Cameron on the 3D conversion for ‘Titanic’ according to Deadline. I wonder if this has anything to do with the 4th installment of ‘Jurassic Park’ which is coming out sometime in the next couple of years. I bet it does. Let’s not forget that the original Jurassic Park will be re-released in 2013 (its 20th anniversary) in theaters nationwide with an upgrade to 3D. So I expect, that this new project by a James Cameron employee will be in 3D as well. This entry was posted on Monday, April 30th, 2012 at 2:54 pm	and is filed under Film, News. You can follow any responses to this entry through the RSS 2.0 feed. You can skip to the end and leave a response. Pinging is currently not allowed. « ‘Murphy Brown’ Headed Back To Television?!?! ?